GE Hard to Goof Up Pictures Ad 1968 This is a November 29, 1968 advertisement. It is a nice color ad from General Electric for Camera Flashcubes. 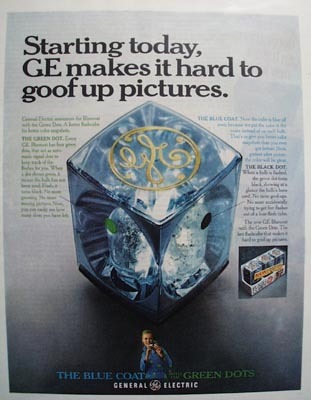 It reads, ""Starting today, GE makes it hard to goof up pictures "" Shows a large picture of the flashcube. In excellent condition. Photo is taken through plastic and may show wrinkles or crookedness that is not in the ad. This magazine tear sheet measures 10 1/4"" wide by 13 1/2"" tall. Items Similar To "GE Hard to Goof Up Pictures Ad 1968"
Ivory soap for hard worker men Ad 1916.